Let's get this out of the way: I'm a bigger DC fan than Marvel. This may be due to being a diehard Batman fan or growing up with the films/TV shows that came from the DC world. However, that's not to say I'm not a Marvel fan. I am! It can happen. Who says I have to choose only one?! I'm a big X-Men fan and I've watched many Marvel series, which is why I am reviewing this film today. The latest movie I will be reviewing is the third adventure in this Marvel hero's series: Captain America: Civil War! The Plot: The world has been divided in opinion on superheroes after the recent destruction caused in the previous Marvel movies. 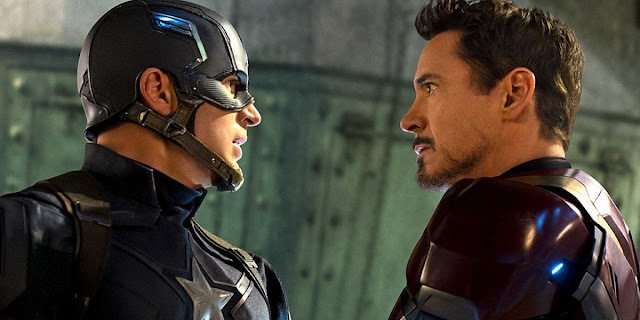 Captain America (Chris Evans) and Iron Man (Robert Downing Jr.) lead two factions of Avengers heroes against each other to determine what to do with a global crisis. Captain America: Civil War is a thrilling blockbuster with captivating special effects and thought out dialogue. With such a big cast included in this one movie, it was great to see each character receive some form of character growth, resolution and screen time. The introduction of Black Panther, Spider-Man and Ant-Man didn't come across as heavy handed; it felt natural for their inclusion into the film. And I was surprised that I did leave the film with a clear, definitive choice on which superhero/group I would side with! My problem with Captain America: Civil War is that it came across less of a Captain America movie but more of a mini-Avengers movie. There are SO MANY CHARACTERS in this film that sometimes I had to piece together who was siding with whom. There's a reason we go specifically to watch ensemble movies - I wished Captain America would've had his moment. Though, it was still great to see a clear focus and direction. Captain America: Civil War is fun, fresh and a good time. You should check it out and join in the chat on which side you would choose.